Ah, we are up to our 16th edition of pop from around the globe. Yes, we work our fingers to the bone scouting good music, and all you need to do is relax and enjoy it. I operate with very few rules here: Write about music I like, spell most words correctly, don't press the "publish" button unless mostly sober (this one is more of a guideline than an actual rule), don't insult anyone's close relatives, and pay attention any time Vieux Farka Touré releases and album. So here we are, with Touré releasing The Secret on Six Degrees Records. 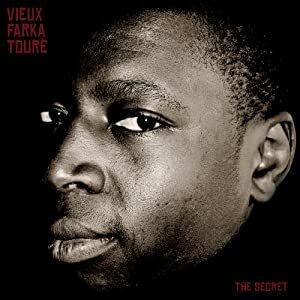 The Secret, produced by Soulive's Eric Krasno, builds on Touré's strengths in combining traditional music of his native Mali with American blues. Moreover, it includes collaborations with Dave Matthews, Derek Trucks, John Scofield, and another African guitar legend, Vieux's father, Ali Farka Touré. "The Secret" -- Father and son, in their last recorded session before Ali died. Nothing more needs be said. Chill sounds from Burning God Little is our next offering. Burning God Little is the performing name for Martin Hartgen from Oslo, Norway. Hartgen's music fuses elements of shoegaze, dream-pop, and electronic. It is good, upbeat stuff. Toronto duo Dog is Blue describe their music as "garage folk". As I understand it, the idea is to take the themes from folk but leave behind the earnestness. The members are Paul Watson and Laura Heaney. Gil Scott-Heron died yesterday after years of struggle with various demons. But his legacy is significant. "The Revolution Will Not Be Televised" in 1970 was like capturing lightning in a bottle. Staggering. If you've never heard it, or at least not for a long time, you owe yourself a careful listen. And seemingly every Facebook friend I have has posted something about Gil since yesterday. I had not seen this video before. And what a great piece of music. I woke up today thinking I'd do this next week for the Soul Corner but it shouldn't wait. Did you hear? Radical Face. One of the joys of my life is that my teenage daughter has impeccable taste in music. By that I don't mean to say she likes everything I like. That actually would amount to a certain level of taste on my own part that I do not claim. Our relative musical leanings could be charted with a two-circle venn diagram, with the overlapping part making up the majority of the surface area. (I have this buddy, Jay, who lives in San Diego. I don't really know what he does, but I do know he can do awesome venn diagrams. If I can find one of his old ones, I'll try to link to it. They're freaking awesome. You don't think a venn diagram can be awesome until you've seen one of Jay's.) But she can't stand some of the harsher crap I play, and sometimes she'll put something on that she thinks is great but which is unidentifiable as to genre, unless there is a genre called Utter Shite. But were it not for her, we'd never have played bands in our house like Neutral Milk Hotel, or Silver Jews, or, more recently, Girls and Frightened Rabbit, and bunch of others. For whatever reason, I'd considered and never pulled the trigger on any of those bands, and she thankfully corrected those mistakes. Then there are the times she'll bring something home that I've not only not considered, but never even heard of, and one of those times is what this post is about. A couple of years ago she put on the album Ghost, by a Jacksonville Beach, Florida musician named Ben Cooper who records as Radical Face, among other things. She said 'you have to hear this.' I probably responded with an appropriately skeptical "you have just wasted your money" paternal grunt or something, and then was pretty much blown away at first listen. It's so expansive and beautiful that it's hard to believe it was recorded in a bedroom studio by one guy. It's mercifully spare in electronics, and rich in acoustic guitar -- except where the drama of a symphonic flourish is necessary. Really, though, the best way to describe it is to say it's a movie score looking for a Wes Anderson film. Here's a really nice video for the first proper song on the album, "Welcome Home. The album didn't receive many reviews when it came out in 2007, and those it did receive included a few tepid responses. I think full-on terrific, all the way through. Here's another track off Ghost, called "Wrapped in Piano Strings." I found myself checking up on Radical Face recently and discovered they/he released a 6 song EP, Touch the Sky, via Berlin's Morr Music, and that the plan was to release 3(!) full-lengths, 40 songs all told, during 2011. Apparently a dispute with the label erupted, and the damned lawyers got involved (imagine: German Lawyers! Ja vohl!). Now he appears to have put that behind him, and is planning to do the releases himself. I'll keep an eye out, because who doesn't want to reward that kind of DIY spirit? Here's a really nice tune from the EP, called "Doorways." Radical Face website -- Ben's a really good writer. Check it out. I'm intrigued enough to subscribe to the RSS feed for this little music competition bracket, and learned to my horror today that Iron Maiden is beating Neil Young. I guess Neil's a pacifist and all that, but still. The Soul Corner takes requests and this week we got one for the great Stevie Wonder, whom of course we were going to get to at some point. I am from Detroit after all, and Stevie is one of my mainest of main men. He's a gifted giant of a musician, and a talented writer, philanthropist, community leader, singer, producer, and a great American. He's in the Bob Dylan / Ray Charles stratosphere, in a league of his own. So we can't highlight just one song as we generally try to do here. Stevie's most creative period was 1972-76 when he released 5 classic concept albums that took Motown and R&B to heights not achieved before or since. The Beatles and Stones might have put 5 in a row out this good, we could argue the point, but that's about it. This run was and remains a staggering achievement. The musical and thematic reach of these records cannot be overstated. We could write a book on this period, but we'll settle for 5 quite varied songs to ever so partially tell the story. We'll go in chronological order, starting with Music of My Mind, which along with Marvin Gaye's What's Going On, took Motown to far more personal and experimental terrain. This vid is a later live version of "Superwoman" from that record. It was a bold step forward for Stevie, far from the standard Motown sound. I love this vocal, especially at the song's conclusion. You've heard thousands of break up songs in your life, but few with this kind of raw emotion. And last but certainly not least in this quintuplet of genius, was the double record Songs in the Key of Life, one of those pieces of nearly unparallaled American artistry that everyone needs to own a copy of. The choice here is "Pastime Paradise", a bold experimental song that broke a ton of new ground and influenced everything after it from prog rock to hip hop. It's an incredible piece of music. Rock, soul, R&B, experimental, progressive, love ballads ("You Are the Sunshine of My Life"), a classic ode to a child coming into the world ("Isn't She Lovely"), Stevie did it all and then some in these 5 records in just 4 years. He was at the top of his game -- composing , producing, writing profound lyrics, and playing nearly every instrument. Wow. The Soul Corner bows down to the uniquely talented and peerless Stevie Wonder. By any reasonable measure, Seapony is having a good year. The buzz for the Seattle band has been building for months, their LP is being released on May 31 by Hardly Art, a subsidiary of Sub Pop, and The Pains of Being Pure at Heart selected them to open for them when they played here in April. And as you listen to "Dreaming", the opening song of the album, you can see that the buzz is well deserved. The group consists of Jen Weidl, the singer, Danny Rowland, the primary songwriter and guitarist, and Ian Brewer, the bassist. Danny and Ian have known each other since high school days in Oklahoma. They moved to Washington in 2001. Danny then spent a few years in Ohio, meeting and moving back to Washington with Jenn in 2010. "Dreaming" had been composed back in Ohio, but the remainder of the songs on the album were composed after the group was formed last year. The most obvious components of the band's sound are the female vocals and the fuzzy, jangly indie pop guitar. The music is simple, honest three chord songs of under three minutes with engaging hooks and lyrics focused on romantic matters. Timekeeping duties fall to a simple drum machine. To me, the band's sound is a blend of Beach Fossils and Pacific Northwest icons, Beat Happening. The Beach Fossils reference is obvious, and most relates to sound. As for The Beat Happening comparison, I think it is more in terms of structure and attitude. I admit that Jen's engaging, breathy vocals won't be mistaken for Calvin Johnson's deep tones. But the simple melodies, DIY feel and emphasis on the classic song performed with conviction is what Beat Happening brought to the table. And it seems to me that Seapony does that as well. Music like that can get overlooked when the listener is looking for showmanship, wild guitar runs or clever electronic beats (all of which can be quite nice, by the way). But joys of a Seapony song won't fade away when faced with a new musical fad. I expect this band to grow and provide its fans, which includes me, with good songs for a long time. But for the present, I doubt that fans of indie pop will find a more perfect summer album than this one. And if you want to taste the entire cake to evaluate for yourself, here is a generous chance to stream the entire album. Enjoy, lucky people. One final note for Seattle fans, the band's album release party is June 2 at the Vera Project, and the other band on the bill is 14 Iced Bears. For Seattle fans of live indie pop, you may not have a better gig available for a long while. Here is the Facebook event link. Just a great little six-song EP Will Johnson of Centro-matic sat down with Jim Eno of Spoon and recorded in February. All acoustic and pretty stripped-down, though there's a bit of reverb here and there. Here's an interview with Will subtitulada espanol, as they say in Spain. Talks about Texas, the origins of Centro-matic, the new album (out June 21, tour starts the next day) and other things. For reference, here is our review of the album. Glasgow's dance rock outfit The Dirty Cuts gives us "2 Page Spread", making it the second week in a row we've featured knife crimes in Cool Video Thursday. What is happening to this place? 2 Page Spread / The Dirty Cuts from Robert McKillop on Vimeo. And now for something completely different, Aidan Moffat and Bill Wells provide a song and video showcasing Moffat's off kilter sense of humor and Well's stunning musical sense -- "Copper Top". As Moffat says in the song, "Birth, love, and death: The only reasons to get dressed up." Happy 70th Birthday Mr. Bob Dylan! My friend the great musician/writer/producer Joe Henry said this at his Facebook page: "Let us begin to celebrate the 70th birthday of the man who for some of us has been thomas jefferson, harriet tubman, james dean, federico fellini, and muhammad ali, all stitched upon a single frame. rave on, bob..."
And also, my very favorite of his more recent work, a song that captures all the uncertainties of a middle aged man. The span of Bob's artistry and reach is literally a lifetime, many lifetimes actually, mine, his, and many who came well before and well after ours. I am posting a short bit on a soul song every Friday for the Soul Corner, a WYMA feature this year. For 2012, I'm leaning towards Bob Dylan Friday. The city of Stirling gives us indie pop group Miniature Dinosaurs. The groups consists of Barry Maclean (Vox, Guitar), Alban Dickson (Bass Guitar), Craig Ferrie (Guitar, Synth), and Sam Waller (Drums). The group only has been actively playing shows for a couple of years, but have released two EPs and a single in that period. Somewhat unusually, they have a clothing endorsement contract. Here is a live studio performance of "Cold Shoulder". I like the vocal styling on this song; it reminds me of Franz Ferdinand. We See Lights are an Edinburgh area collective that was formed in 2007. They list their members as follows: "We See Lights are from time to time; Stephen Bogle, Paul Dougall, Ross Harvey, Jonathan Lapsley, Allan Rae, Paul Livingstone and many others." The style is twee pop, indie pop, folk rock. They released a six song EP, Twee Love Pop, on April 30, 2011, on the Heroes & Glueplots label. "Hope You Like the Smiths"
Crayons are from Dunfermline, Scotland. The sound is indie pop, but the difference from many bands, I think, is in the somewhat unusual rhythms. There music seems to reflect a number of influences, and the result seems to be more of a weave, than a blend, so you can appreciate the components as you listen. Crayons are Sean Defrancesco, Greg Robins, Andrew Carty, and Nick Hernandez, and they are another unsigned band chosen to play T In The Park this summer. Philadelphia has given us some of the most enjoyable, if underappreciated, rock music of the last 10 years or so. Think about it, there's Marah, Living Things, Dr. Dog, Free Energy, you could probably think of another quick dozen or more off the top of your head. These are bands that collectively have made and are continuing to make great record after great record, and yet relative to their considerable artistic merit, they remain frustratingly obscure. How about a little more frustration? The Philly band Restorations (if you want to google them without getting every home improvement site out there, try "restorations the band") recently released their self-titled debut full-length, and it's a shoo-in for my year-end top 10. At just under 35 minutes and 8 songs, it's really a tremendous album, with big, indulgent song structures and sheets of beautiful sound. Consider, for example, "Neighborhood Song", with its crashing bar chords giving way to a melancholy verse about remembering your childhood as you grow older (I think). The song ends with a pounding bassline, over which Jon Loudon's shopworn voice sings, "The song of the neighborhood/Sung like the song of the world" and then all sonic hell breaks loose for another minute, and then slows down before it breaks loose again for another couple of minutes. You'd think a band these days couldn't get away with a lyric like that, but it works so perfectly here. Listen to it, and it'll make the hair stand up on the back of your neck. People who hybridize music tend to be insufferable, like a bunch of idiots dressed in black standing around talking about what they taste in a glass of wine (It's peppery! I taste marbles!) but dammit I'm going to do it. Rocksteady and I are huge fans of the now defunct Brooklyn band Pela, and I think there's a good bit of that genius flowing through these songs. So maybe Restorations is like Pela with a good deal more noise heaped on top (which is never a bad thing). That noise has connections to shoegaze acts like Catherine Wheel. Loudon's hoarse vocals do remind me of Rob Dickinson at times. These songs also will make you think at times of some of the Scottish bands that make melodic noise, like Frightened Rabbit or Twilight Sad, or just melodic music, like, I swear, Glasgow's Blue Nile (mainly because the vocal melodies at times sound like Paul Buchanan). In the end, though, it's really an American sounding record, with American excesses that make it one of those off-the-radar albums you shouldn't miss. Here's another fantastic tune, "Broken Vacuum", with a beautiful, chiming lead that, if you're old enough, will resurrect dim memories of the Alarm or Wire Train. For all the talk of great vocals and guitars and bass, if anyone gave me a Heisman vote on this album I'd give it to the drummer (I'll edit if I'm able to figure out his name -- I did, courtesy of the Restorations page at the site of their record label - Tiny Engines. Oh, his name is Carlin Brown). In this wonderfully produced record, drums are put front and center, and are a propulsive, emotive force. In the dozens of dramatic changes in the songs, it's the drums that lead the way, most notably in the middle of the second track, "West River." There's not a lot of quality sounding live stuff up yet on youtube, but here's a pretty decent (and criminally underviewed) version of that tune. Bands this great deserve your support. Here's the Bandcamp page where I was able to download this excellent album cheaply and without adult supervision. I'll be writing much more on the Parson Red Heads as the release of their new CD Yearling approaches this summer, but here's an audio peek and way to download the lead track "Burning Up the Sky". It has all the features that make me love this band so much - gorgeous harmonies, tremendous lead vocals by Evan Way, positive spirit, tight writing and disciplined arrangements, just perfect power pop music. The new record is a big step up for the band, who got great production and engineering help from alternative pop legends Chris Stamey and Mitch Easter. Fans of Rocksteady74's Scottish pop series should like this band this a lot. Stay tuned in months ahead as WYMA will be all over the Parson Red Heads and Yearling.